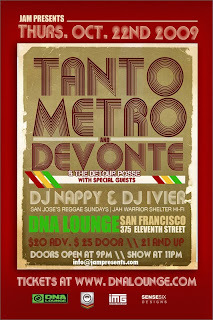 DNA proves that Tanto Metro & Devonte is definitely family to the wonderful people of San Francisco, who continue to support and welcome the duo to their spectacular city. The Bay Area will be home to the dynamic duo who will be performing live at 375 Eleventh Street on Thursday, October 22, 2009. They will be backed by their brothers from the incredibly talented Detour Posse Band.